Here is a selection of dentures before and after photos, to show the changes that can be made with a good set of dentures. Sometimes there are some natural teeth remaining, and we want to match the denture teeth to the natural teeth. These pictures of dentures show how this gives a more natural appearance overall, even though the teeth may be rather crooked. 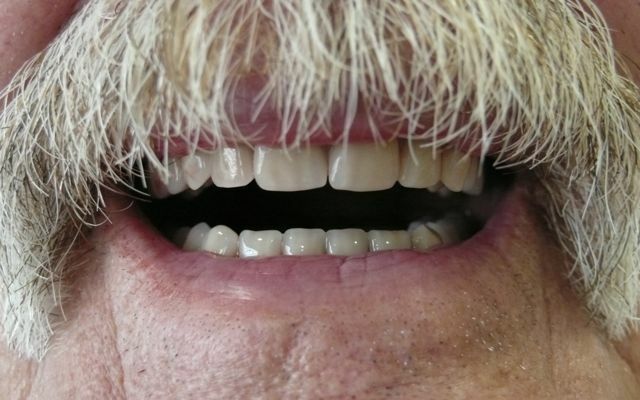 Dentures before and after photos can only show part of the story - although the dentist will make up dentures according to dental principles, the patient also has a say in how the teeth will look. They may want larger or smaller teeth than usual, or perhaps whiter teeth than standard. At other times, any remaining natural teeth may be so bad that they have to be removed. This lets us position the denture teeth nice and straight. 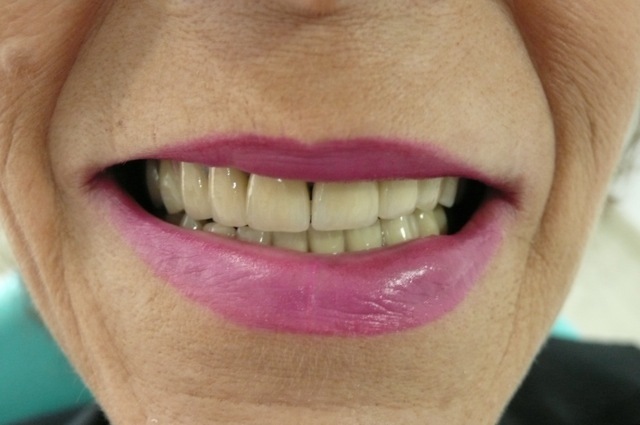 Here are some more pictures of dentures before and after; photos that show different designs. The first one is where we still have some healthy upper teeth, but they are badly worn and chipped. The lower teeth are very loose, and must be removed. Note that the upper lip is higher on the left side of the photograph than on the right side of the photograph. Also. the LOWER lip dips down on the right-hand-side of the photograph. 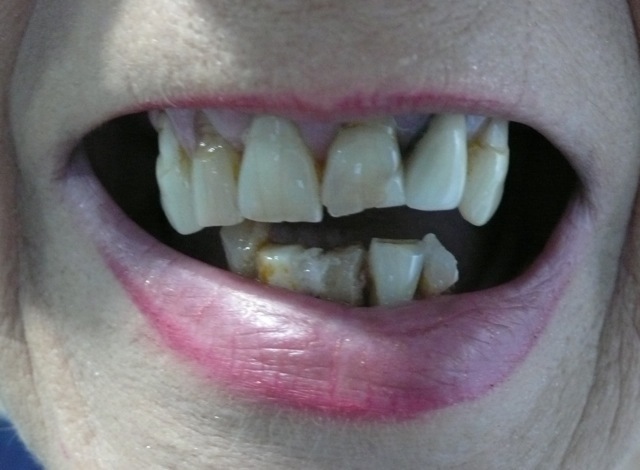 This can give a misleading appearance to whether the teeth look "straight" at the end of treatment. We have to accept that humans are not perfectly symmetrical, so we make the new teeth "straight" as far as the jaws go, and accept that the lip lines will not level. This will give a very natural appearance. 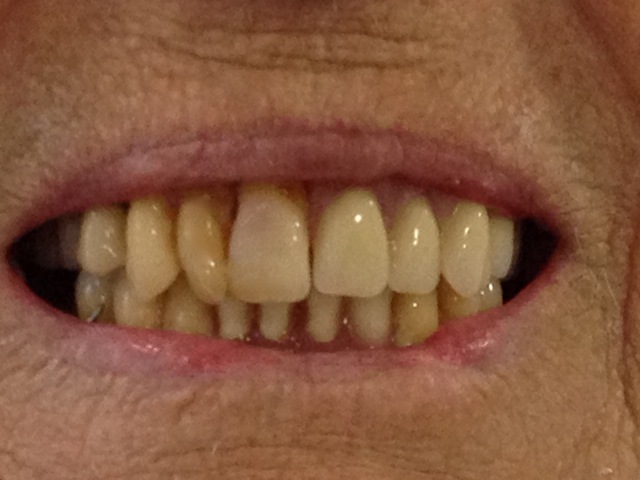 We will make a full lower denture to replace the lower teeth. We will put crowns (or "caps") on the upper teeth, and make a part denture to replace the upper back teeth. 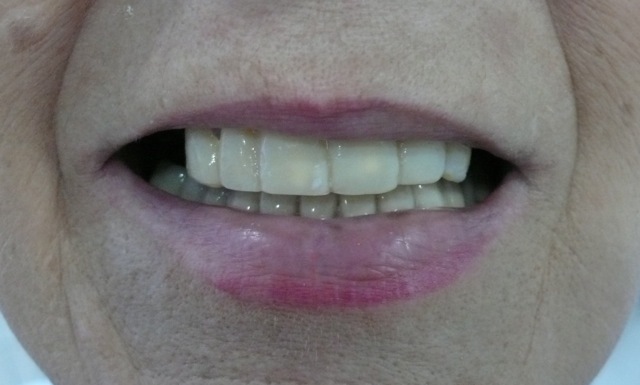 This is the intermediate stage, above, where we have acrylic interim crowns ("caps") on the upper teeth, and an interim lower full denture. This intermediate stage allows the patient AND the dentist to check how things are looking before moving on to the final crowns and final denture. 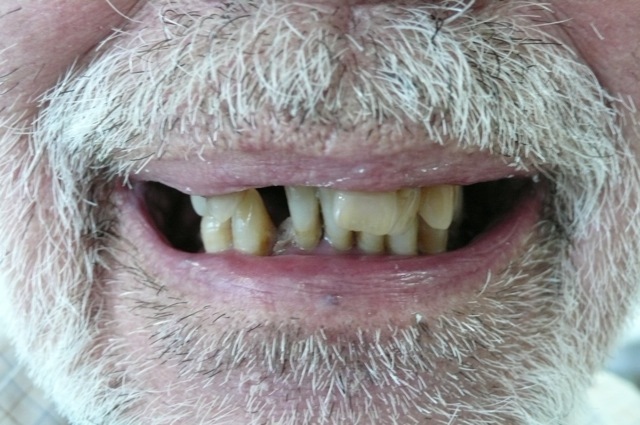 This is the final result, with porcelain crowns ("caps") on the upper six front teeth, and a removable partial denture replacing the upper back teeth. On the lower jaw there is a full lower denture to replace all the missing lower teeth. These pictures of dentures above show the stages involved in replacing several - but not all - missing teeth. Below, we have a situation where there are only 3 broken teeth left. The only solution here is to remove these teeth and make a full denture. And below we have the final full denture fitted. A big improvement! We also made a new full denture for the lower jaw. 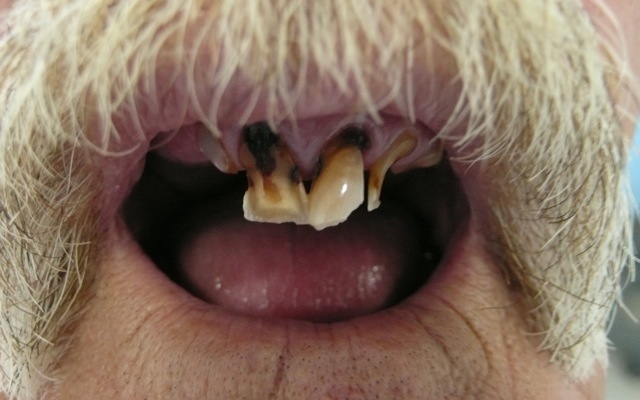 Interestingly, this patient shaved off his mustache a few weeks after getting his dentures. He said he only grew it to hide his bad teeth! 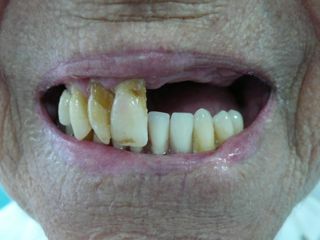 In the next set of dentures before and after photos, there are some front teeth missing on one side. 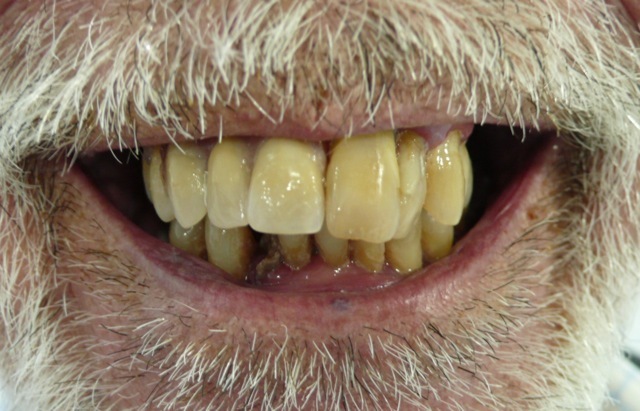 This patient was extremely nervous of dental treatment, and only wanted the simplest solution. After making the denture, (below), things looked a bit better! He could smile a bit wider than before! Here is a lady who knocked out several front teeth in a fall. This collection of dentures before and after photos just goes to show the sort of improvements that can be made with simple dentures.